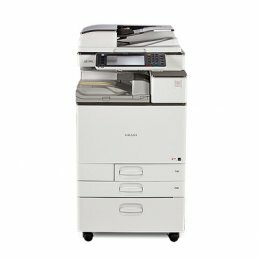 The Ricoh Aficio copier provides advanced digital copying with plenty of room for advanced features and finishing capabilities. It is ideal if you desire multiple choices of layouts and booklets, leaflets and brochures. With a Ricoh machine, you can have your own in-house printing team put together your own documents with a professional finish. These copiers are known to be the best around. The Ricoh MP 301SPF Multifunction is an efficient communications system that enables quick and easy sharing of documents and other information. The Aficio MP301SPF Copier has incorporated innovative ways to manage print, copy scan and fax output that will minimize costs while the high operating speeds of up to 31ppm will ensure a smooth workflow. The Ricoh Aficio MP 301SPF services-led platform provides a wide variety of options that give you the highest levels of control over your document management, including security features such as hard drive overwriting, enhanced encryption and user authentication. The Ricoh MP 305SPF is a compact, multifunction device that operates at 30 ppm. The Aficio MP305SPF Copier features an intuitive Smart Operation Panel which is easy-to-use and allows you to manage your documents directly from the panel. With the Smart Device Connector on this Ricoh Aficio MP 305SPF, you can grab information from any cloud application and send it to the MFP from your personal mobile device for fast, convenient and secure mobile printing. The Ricoh MP 402SPF is a compact multifunction monochrome machine, which prints at up to 42 pages per minute. The Aficio MP402SPF Copier features a Single Pass Document Feeder, allowing you to scan at up to 80 pages per minute. With the Ricoh Aficio MP 402SPF, you can reduce paper usage by printing double-sided and you can save electricity by programming the MFP to power on or off at specific times. 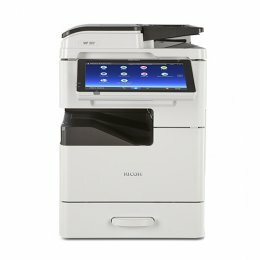 The Ricoh MP 501SPFG is a compact, multifunction black and white device that can print at up to 52 ppm. The Aficio MP501SPFG Copier features an intuitive 10.1 inch colour Smart Operational Panel touchscreen to set shortcuts and access important details, so you can be more productive and informed. 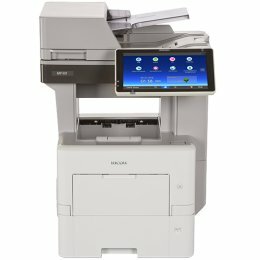 With the Ricoh Aficio MP 501SPF you can print and scan remotely via your smartphone or tablet and can take advantage of user authentication to track users, projects and costs. The Ricoh MP C4503 is an all-in-one copier, printer scanner and fax. The Ricoh MP-C4503 prints in color and black and white. The Aficio MPC4503 prints at up to 45 ppm. This Ricoh MPC4503 copier features a warm-up time of less than 20 seconds. The Ricoh MP C400 is a Digital Color Copier which offers true multi-function flexibility and advanced high-performance capabilities and a fast print speed all in one compact device. The Ricoh C400 Copier has a smart and sleek design and also includes features which will increase productivity and ensure low cost of maintenance. The Ricoh MP-C400 Color Copier is the ideal solution for smaller work-groups. 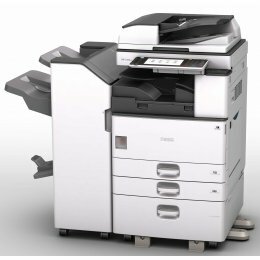 The Ricoh MP C3003 is a multifunction copier, printer, scanner and fax that can print in both color and black and white. The Ricoh MPC3003 delivers high quality printouts at up to 30 pages per minute. The Aficio MP -C3003 features a quick, less than 10-second recovery time from sleep mode. The Ricoh MP C3503 is a multifunction color copier, printer, scanner and fax. The Ricoh MP-C3503 copier has an output speed of 35 ppm in both monochrome and color. The Aficio MPC3503 features a copy resolution of 600 dpi. The Ricoh Aficio MPC3503 recovers from sleep mode in less than 10 seconds. 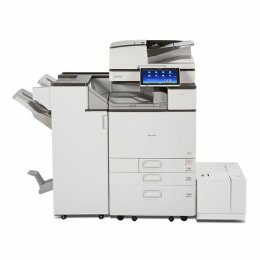 Enjoy speedy, reliable, cost-effective performance from the Ricoh MP 2501SP Multifunction Copier. 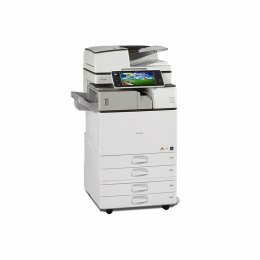 Featuring a space-saving design and the latest technology, the Aficio MP2501SP Copier provides copying and printing functions up to ledger size, as well as scanning and optional fax capabilities. The Ricoh Aficio MP 2501SP incorporates advanced security and environmental features, as well as portable and Cloud-based applications to meet the evolving demands of today’s workforce. 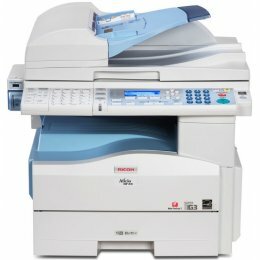 The Ricoh MP C5503 is a multifunction color copier, printer, scanner and fax. 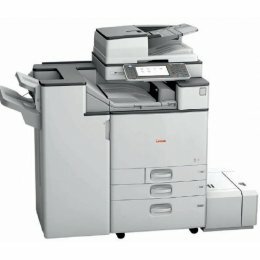 This Ricoh MP-C5503 Copier has an output speed of up to 55ppm. The Aficio MPC5503 features a copy resolution of 600 dpi. The Ricoh MP C4504 Printer can print up to 45 pages per minute in color and black and white. This Ricoh C4504 Laser Printer is fully equipped with multi function copy, print, fax and scan modes. With a high paper capacity of 2300 pages, a printing resolution of 1200x1200 dpi and a 10.1" tilting, full color touch screen, it is a perfect option to enhance your office workflow. 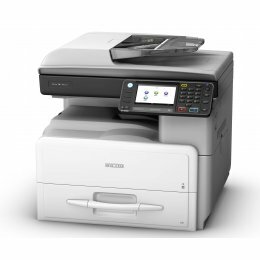 The Ricoh MP6054 features copy, print, scan and optional fax capabilities. 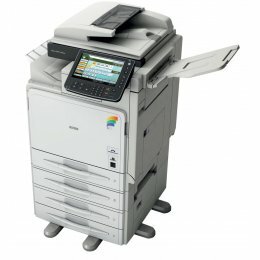 Printing in black and white at 60 pages per minute, this Ricoh multi function is ideal for large and mid-sized workgroups. The MP-6054 features many time-saving features to help you fly through your tasks, such as mobile print, 4,700 page paper capacity, scan-to email, print from USB and more. 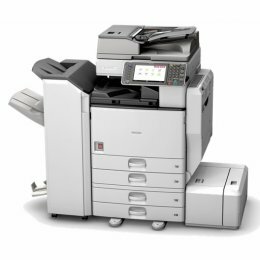 Operating at impressive speeds of up to 50 pages per minute, the black and white Ricoh MP 5002 Multifunction Copier provides innovative functions in a user-friendly design. Enjoy a complete document management system with the Aficio MP5002 Copier that copies, prints, scans and faxes, with advanced security features and optional integrated web browser. The Ricoh Aficio MP 5002 is an intuitive and customizable device, ensuring enhanced productivity and a smooth workflow, even at the busiest of times. 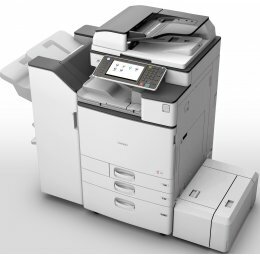 Stay ahead of the competition with the black and white Ricoh MP 4002 Multifunction Copier. Boost productivity with a customizable control panel ready to do your frequently used tasks and access to cloud-based solutions on the Aficio MP4002 Copier. 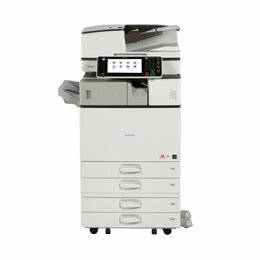 The powerful, 40 pages per minute Ricoh Aficio MP 4002 provides advanced copy, print, scan and fax functions in an intuitive design, ensuring a seamless document workflow. The Ricoh MP 3053 is a multifunction, monochrome machine which is able to copy, print, scan and fax. The Aficio MP3053 Copier has copy speeds of 30 pages per minute. The Ricoh Aficio MP 3053 is an environmentally friendly machine which will save you both paper and energy with features such as standard duplexing, preview before print and many others. Stay ahead of the competition with the Ricoh MP 4002SP Copier. 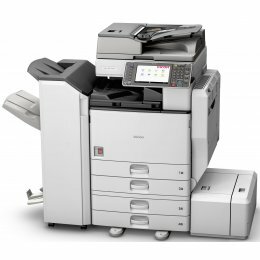 Operating at up to 40 pages per minute, the black and white Aficio MP4002SP Multifunction provides copy, print, fax and scan functions, ensuring a seamless workflow. Enjoy a customizable control panel, user mobility support, access to cloud-based solutions and more on the Ricoh Aficio MP 4002SP Copier. 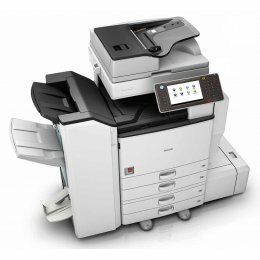 A Ricoh copy machine is one of the best on the market for producing professional documents with many different finishing capabilities. 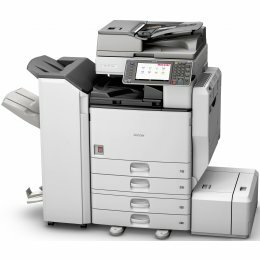 If you want to be able to print your own brochure, leaflet or flyer then Ricoh Aficio will have the copier that will allow you to do it all with minimum head-ache and expense.